The book publishing world has undergone massive disruption in recent years. This presents challenges and opportunities for book authors. Many academics are writing books, and communicators directly or indirectly, can provide support. 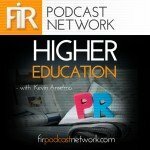 On episode 55 of FIR on Higher Education, Oral Roberts University Professor David Burkus discusses his experiences writing two different books.